Home > Departments > Faculty > S. Leslie Blatt Ph.D.
Office: Room 228, BioPhysics Bldg. 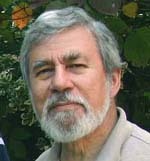 Les Blatt is an experimental nuclear physicist, pioneering the study of high energy gamma radiation from the capture of protons and cluster projectiles by light nuclei. Much of this work was done during his time at The Ohio State University, with some experiments also at the Indiana University Cyclotron Facility. Some of the techniques he developed formed the basis of detector systems installed in laboratories around the world. In more-recent years, he worked with pre-service and in-service teachers on developing and implementing methods and materials for making science more accessible to pre-college students. Les held a joint appointment in Physics and Education. Courses he helped to create at Clark include Discovering Physics, a "hands-on," laboratory-oriented course for non-science majors developed in collaboration with Clark physicists Harvey Gould and Chris Landee and the late Mauri Gould; Ways of Knowing in the Physical and Natural Sciences, the first of the department’s “ways of knowing” courses, piloted with Tom Del Prete and Marion Guerra, former science coordinator and principal at nearby Goddard elementary school, and later co-taught with Ms. Guerra and with Sarah Michaels, of Clark’s Education Department; Science and Society, developed and first taught jointly with James Gee, a former member of the Clark Education Department, and offered again in 2005 (in updated form) as a first-year seminar; and Energy and the Campus, a core course in Environmental Science developed jointly with the late Chris Hohenemser, physicist and co-founder of the Clark Environmental Science and Policy program. He also created the interdisciplinary course "Seeing the Light: At the Crossroads of Art and Science," which was first offered during the 2005 May Term program in Luxembourg, and was also presented, in revised form, during the 2007, 2009, and 2011 May Terms. Dr. Blatt also regularly taught the Physics Department's popular astronomy courses. Les and his colleagues were involved in science-teaching workshops with the Worcester Public Schools in the South Quadrant of the city, as well as with the Malden Public Schools and a project for reforming elementary school science in Jamaica. He also was a co-organizer of the Hiatt Center's faculty/teacher Curriculum Study Teams in the science area, and of Summer Institutes on Curriculum and Knowing in the Sciences for Worcester area teachers. He was active on state-wide committees for the development of science frameworks and the teacher-education requirements necessary for the implementation of those frameworks. He remains active in teaching, primarily at the WISE Program (Worcester Institute for Senior Education) at Assumption College, where he has been offering a variety of short courses that explore the impact of science in the broader society, and most especially in the arts.